This high voltage white LED driver electronic circuit schematic is based on the NCP5021 IC manufactured by On Semiconductor . 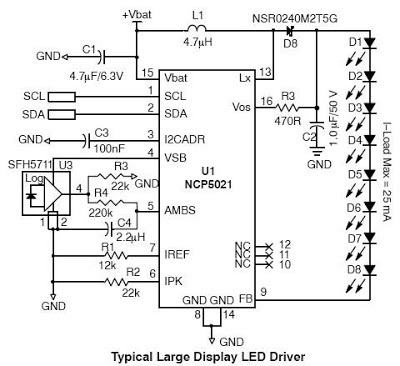 This NCP5021 high voltage white LED driver electronic circuit is designed with ambient light sensing feature . The NCP5021 white LED driver is capable of driving up to 8 LEDs in series for portable backlight applications. The built−in DC DC converter is based on a high efficient PWM boost structure with 32 V output voltage span. The schematic circuit is very simple , requiring few external electronic parts and it can be connected through an I2C protocol to another device or microcontroller . Main features of the NCP5021 high voltage LED driver are : 2.7 to 5.5 V Input Voltage Range , 90% Peak efficiency with 4.7 _H / 150 m_ Inductor , Gradual Dimming Built−in (Automatic Fade In/Fade Out Effect) , Integrated Ambient Light Sensing Automatically Adjusts the LCD , Backlight Contrast , Support the Full I2C Protocol with Address Extension . NCP5021 is a high voltage LED driver is specially designed for backlight driver in applications like : Cellular Phone, Smartphone , Portable Media Player (PMP) , Global Positioning System (GPS) . The circuit application for the NCP5021 require just few external components as you can see in the circuit application from the schematic.